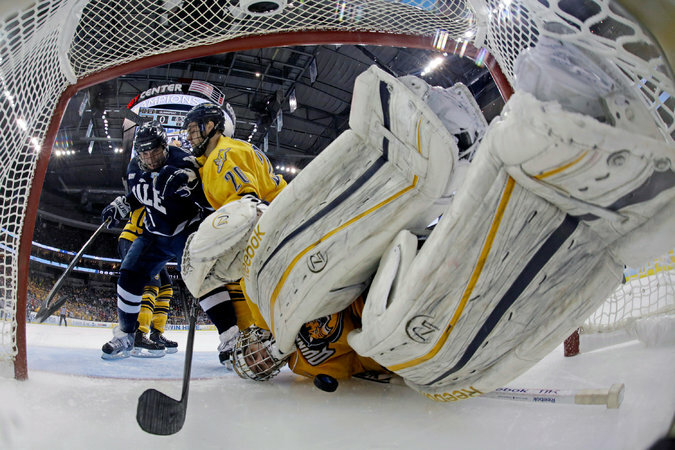 Quinnipiac goalie Eric Hartzell, right, was shoved into the goal cage, as Quinnipiac’s Matthew Peca (20) tried to clear Yale’s Clinton Bourbonais during the N.C.A.A. championship game in 2013. Yale’s Ingalls Rink, designed by Eero Saarinen and opened in 1958, and Quinnipiac’s TD Bank Sports Center, a $52 million multisport facility not yet 10 years old, are separated by eight miles of Whitney Avenue, which connects New Haven and adjacent Hamden to the north. The histories of the two universities’ hockey programs are even more stark, but they enter their first meeting of the season Friday as one of the most compelling rivalries in college hockey, even though the teams never met before 2005. Quinnipiac, ranked No. 3 in the USCHO.com poll, is one of Division I’s two unbeaten teams, at 13-0-2. No. 10 Yale is 5-2-2 after a loss to top-ranked Providence, the other unbeaten, on Saturday.